This procedure is used to remove skin cancer that affects the face and other sensitive areas. The cancer is removed layer by layer. The tissue is examined under a microscope until only healthy tissue remains. 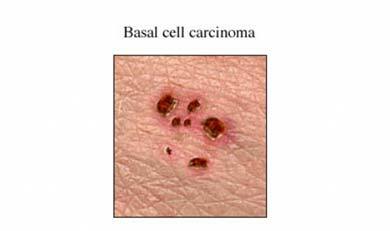 This surgery is an effective and precise way to treat basal and squamous cell skin cancers. It offers a good chance for complete removal of the cancer, while sparing normal tissue. Discuss with your doctor any allergies or medical problems that you have. Talk to your doctor if you take any medications, herbs, or supplements. You may need to stop taking some medications up to 1 week before the procedure. Arrange for a ride home and for help at home. Eat normally the day of the procedure. Local anesthesia will be used. You will not feel pain, but you will be awake during the procedure. The area will be cleansed with antiseptic. A local anesthetic will be injected into the area. Using a small scalpel, the top visible portion of the cancer will be removed. Next, another, deeper layer will be removed. The layer will be divided into sections and examined under a microscope. Each section of the removed layer will be color coded. This will allow the doctor to know exactly where the layer was in the skin. These sections will be frozen and examined under a microscope for remaining cancer cells. If cancer is found at the edges of the removed layer, the doctor will go back to the precise area where that section was removed. Additional layers will be removed and examined under a microscope until all areas are cancer free. For larger wound areas, the wound will be closed with stitches, a skin flap, or a skin graft procedure. Small, shallow wounds may heal without stitches. You will have to wait while the tissue is examined under a microscope, which can take 30 minutes or more. In some cases, this procedure can last for several hours. You should have minimal discomfort during the procedure. There will be some minor pain during recovery. You may be given pain medication. After the procedure, you may be given pain medication and an antibiotic. You will be able to leave the same day. Keep in mind that it is normal for a scar to form. The appearance may improve over time. The doctor will monitor your condition. You and your doctor will talk about prevention steps that include regular follow-up appointments and protecting your skin in the sun. Mohs surgery. Encyclopedia of Surgery website. Available at: http://www.surgeryencyclopedia.com/La-Pa/Mohs-Surgery.html. Accessed March 5, 2018. Mohs surgery step by step. Skin Cancer website. Available at: https://www.skincancer.org/skin-cancer-information/mohs-surgery/step-by-step. Accessed March 5, 2018. Special surgical techniques. American Cancer Society website. Available at: https://www.cancer.org/treatment/treatments-and-side-effects/treatment-types/surgery/special-surgical-techniques.html. Updated April 19, 2016. Accessed March 5, 2018. 6/6/2011 DynaMed's Systematic Literature Surveillance http://www.ebscohost.com/dynamed : Mills E, Eyawo O, Lockhart I, Kelly S, Wu P, Ebbert JO. Smoking cessation reduces postoperative complications: a systematic review and meta-analysis. Am J Med. 2011;124(2):144-154.